One of the most important things to remember when you’re considering an app is this: even if you have an app you still need a mobile website. As the trend to mobile first continues (back in April 2016 already 65% of digital media time was spent on mobile – and it has only grown) it’s increasingly important to think of how your web presence looks and works on a mobile device. Not only do web sites continue to be the largest drivers of discoverability, but apps also continue to be considerably difficult to discover through their platforms. Think of it this way: Any of the times you are going to be working on driving traffic to your digital platform, it’s likely going to be through a mobile web page. Google doesn’t index pages in apps. Articles don’t link to things inside apps. And customers frankly don’t like to download apps unless they serve a specific purpose. What Can’t My Mobile Site Do? Ask yourself this: What will my app do that my website can’t? Then ask: Is it worth spending the money on an app when I could instead invest that in my mobile web experience? Take a look at what Lancome recently did. They worked with the Mobify Platform to build out what is known as a “Progressive Mobile Web” experience to create what is basically an app-like experience through a mobile web site. The brilliant part of this approach is that they have taken all the best practices of interface and UX that work inside apps and touch-enabled mobile devices and brought them to their web site. So in essence, they have an app … but the app is their web site. This means no more maintenance of a separate app (including updates for OS changes at Apple or Android’s whim, etc). So again, my answer to the question “Do I Need An App?” is still “no” … but you need a strong mobile experience. In my view, for most companies that’s a fast-loading, intuitive mobile web site that doesn’t give up any of the value of your desktop site. In fact, it might have additional features that your desktop doesn’t have. Gone are the days of having a desktop site load on mobile, and gone are the days of having your mobile site be a stripped down version of your main site. It doesn’t have to be something as complicated as a Progressive Mobile Web app like Lancome made. It could be a separate mobile site, or a responsive design site with smart changes to design and layout based upon device. (I prefer responsive, as it’s easier to maintain … although it can lead to some performance issues if you don’t do it right). The easy answer is this: When your mobile site can’t do what you need it to. The more complicated answer is this: When your goal is to build a walled garden type platform where you want force customers to stay inside your ecosystem … or you’ll offer a better experience with an app. Honestly, things like Twitter and Facebook and Netflix could all work on mobile sites, but they are also contained platforms where the goal is to control the experience. It’s why Facebook has its own built-in web browser to take you to outside links instead of sending you directly to a web site. But it also can help tremendously with performance, as there are definite benefits to programming in a native mobile language. That said, if you are asking the question of “do I need an app?” The answer is probably no. 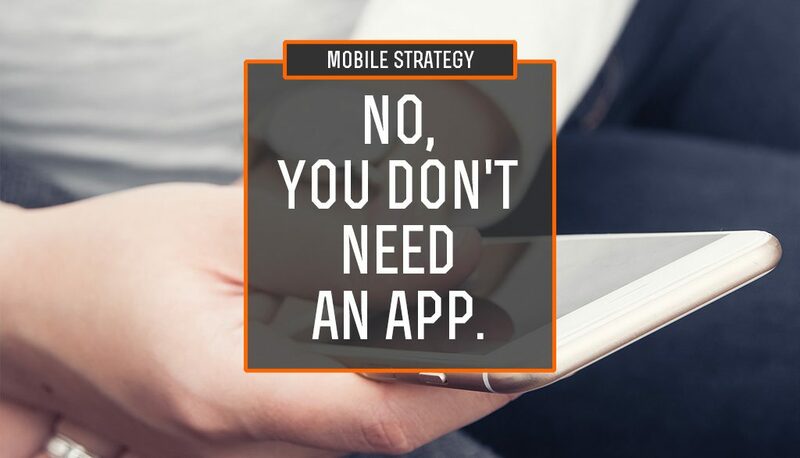 You shouldn’t need an app unless you can argue that an app is part of your overall platform or it will allow you to do things you couldn’t do on your mobile site. First and foremost, get your mobile site working as good or better than your desktop. That’s your main point of contact with customers now, and it needs to be treated that way. Once you have that figured out, then work on adding apps if they make sense.